Life Before the Dinosaurs: Leanchoilia. 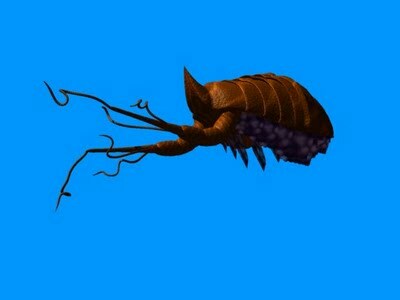 Leanchoilia was a strange creature with whip-like appendages that it might have slung around to grab prey. It was about 2" long and was very common. The name is pronounced Lee-an-COY-lee-ah. Scientists don't know for sure how Leanchoilia found its prey because no eye fossils have been found. 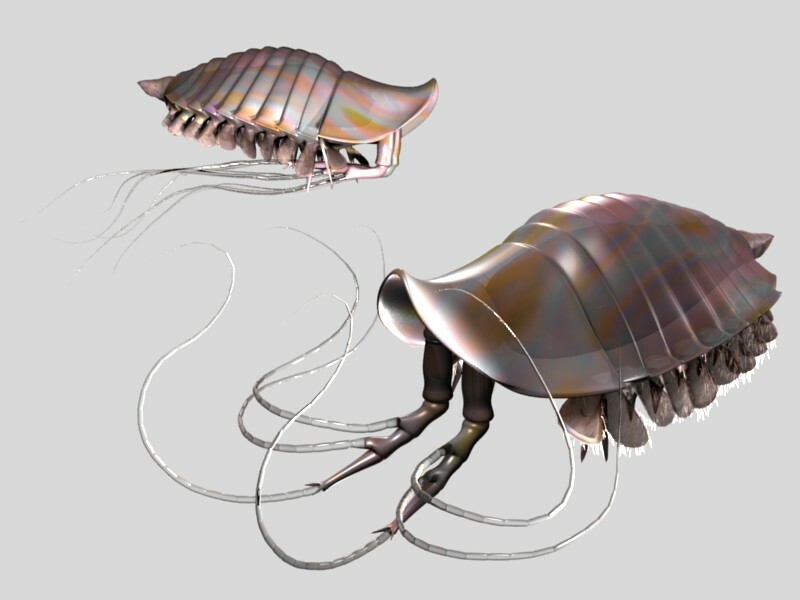 Leanchoilia was probably good prey because it's small and it didn't have anything that could really hurt a predator. Thanks! I really love Leanchoilia too! Maybe those antennae sensed movement in the water, and that's how it found whatever it was that it ate. 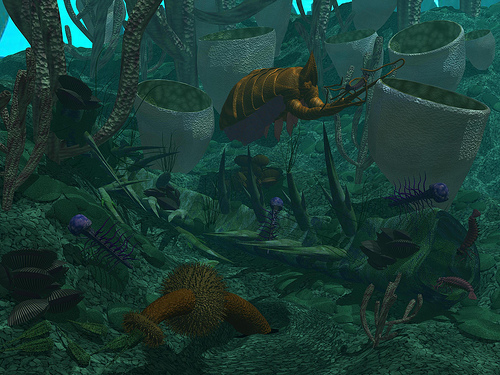 Leanchoilia represents one of the most common non-trilobite arthropods known in the Lower and Middle Cambrian, characterized by great first appendages which are supported by three anterior filaments. A vigorous discussion about the systematic position of this genus followed Walcott’s 1912 description of the genus. Although substantial material had been used in all previous investigations, the presence or absence of eyes remains one of the most controversial characters of its morphology. Walcott himself described L. superlata to have pedunculate eyes, as had been proposed for L. illecebrosa. On the other hand, there is a long history of observations describing two pairs of pits on the head, interpreted as eyes attached near the front of the ventral underside of the headshield. The reconstructions made between 1935 and 1983 did not show any eyes, and the genus was considered to be blind. In this study, we investigated roughly fifty specimens of L. illecebrosa from the Chengjiang and Haikou areas (Yu’anshan Member, Heilingpu; former Qiongzhusi Formation). Just four of these specimens possessed ventrally stalked eyes. These stalks differ from the pendulum-like eyes of Alalcomenaeus. They are very narrow, and at the distal end they are structured rather like a bunch of grapes, with about 100 separate spherical units on the visual surface. Their shape is comparable to the stalks of some crustaceans, or other Chengjiang arthropods. These lenses have a diameter of c. 60 µm and indicate (by calculation) a lifestyle under dim light, probably at the sea-floor at a water depth of under 200 m. The delicacy and low preservation potential of their stalks explains their rarity. Likewise, the fine structures of the visual surface have only a limited chance of preservation, and can usually only be observed in Chengjiang fossils using light microscopy with the most tangential light. If Leanchoilia was a free-swimming animal, the low resolution of its eye would not allow the formation of an image sufficient for hunting or the detection of predators. If, on the other hand, it lived on the sea floor, its eyes may have enabled it to detect priapulid worms by observing their movements in the ground when disturbed by the digging actions of Leanchoalia’s great appendages. We interpret the pitlike eyes described by previous authors as ocellar eyes, in agreement with previous work which showed that no facets are recognisable. We interpret these four dorsal ocelli as homologous to typical dorsal median eyes of arthropods, which are, in general, a euarthropodean autapomorphy. It may therefore be concluded that, like many modern arthropods, L. illecebrosa has two kinds of eyes – two stalked ventral eyes, and four dorsal (ocellar) median eyes. Its stalked eyes indicate that Leanchoilia was a bottom dweller, able to detect worms as prey in the sediment of the sea-floor. This fossil is very common in the Raymond Quarry, which lies not very far above Walcott's Burgess Shale site. Consequently, the extra wealth of material facilitated this detailed reconstruction (shown in this beautiful drawing by Marianne Collins). Prominent are large, frontal appendages with long extended whiplike extensions. Since Leanchoilia was apparently blind (no eye-like structures have yet been found), these appendages helped locate food and keep Leanchoilia informed about its surroundings. Its usual size was about two inches. Generally classed as an arthropod (which is a very large group), Leanchoilia is placed among the arachnomorph (i. e., spider-like) subgroup, along with chelicerates, like present day scorpions and extinct trilobites. I think those antennae may have been used for two uses: sensing prey and predators and maybe digging up their prey. But no one knows for sure.